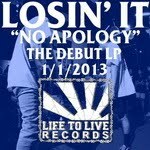 Losin’ It (Florida straight edge) have released a brand new song off of the upcoming No Apology LP. The release is due for release on January 1st, 2013 via Life To Live Records . Check out ‘Bitter Taste’ here.